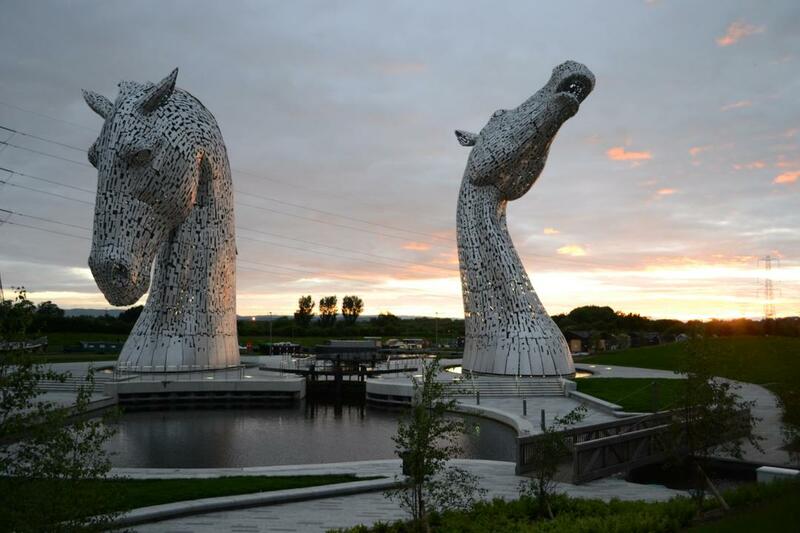 Funded with lottery money, the Helix Project involved the regeneration of a large area between Falkirk and Grangemouth, creating a welcoming green space with networks of paths, wildlife reserves, wetlands, outdoor sculptures and a watersports lagoon. 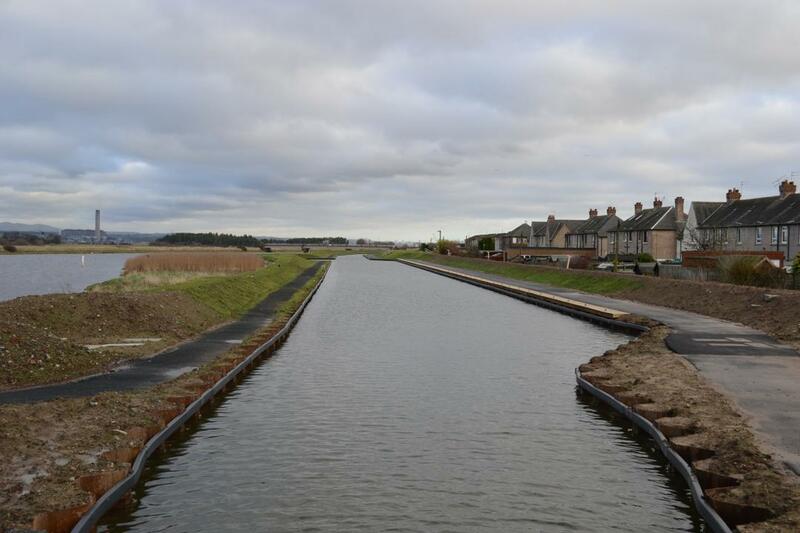 It has also made major improvements to the Grangemouth end of the Forth and Clyde Canal. 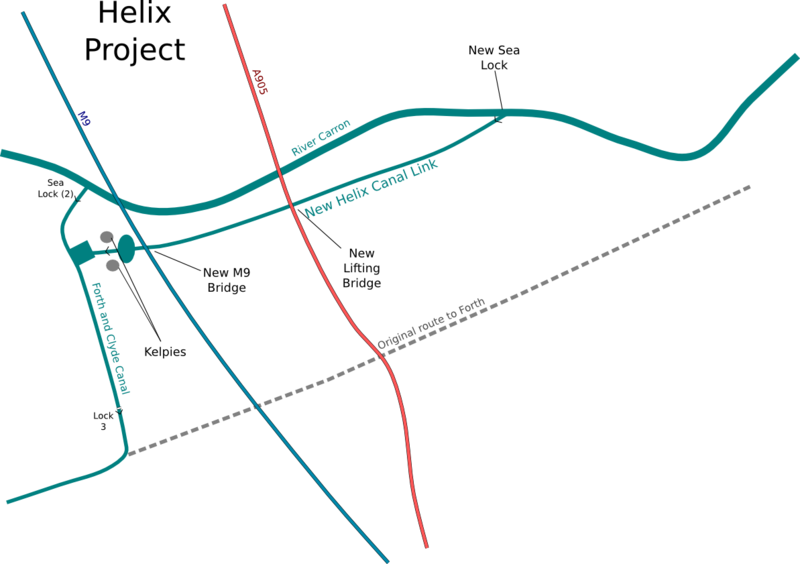 After the canal closed in the 1960s, more than a mile of the eastern end of the channel (from the old sea lock at Grangemouth up to lock 3 at Orchardhall) was filled in. A warehouse and several roads including the M9 motorway were then built on top, making restoration of the canal's original line very difficult. So when the canal was reopened for the Millennium, an old branch that led directly to the River Carron upstream of the M9 was restored instead. But this was far from ideal - the tidal nature of the river and the restricted clearance under the various bridges meant that entering the canal's sea lock could be dangerous and should only be attempted at certain times. 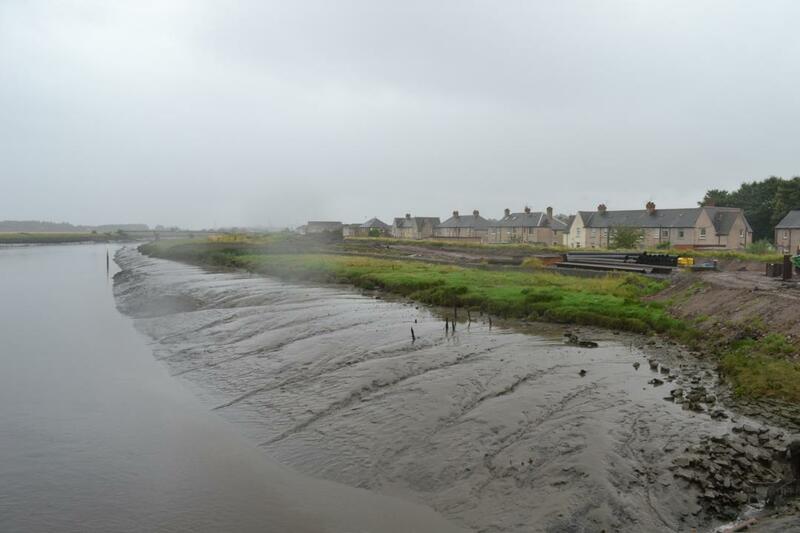 The Helix project has created a new section of canal that joins the Carron further downstream, alleviating these problems. 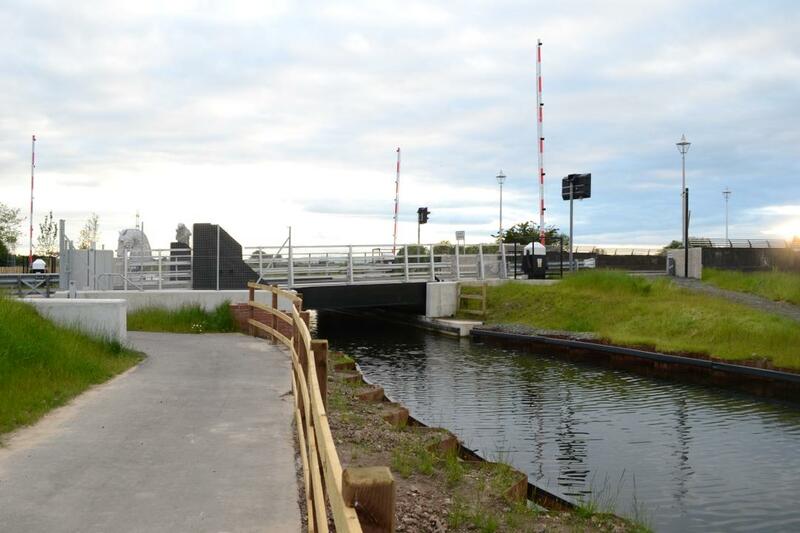 The new cut diverges from the old just above the 2001-built Carron Sea Lock. 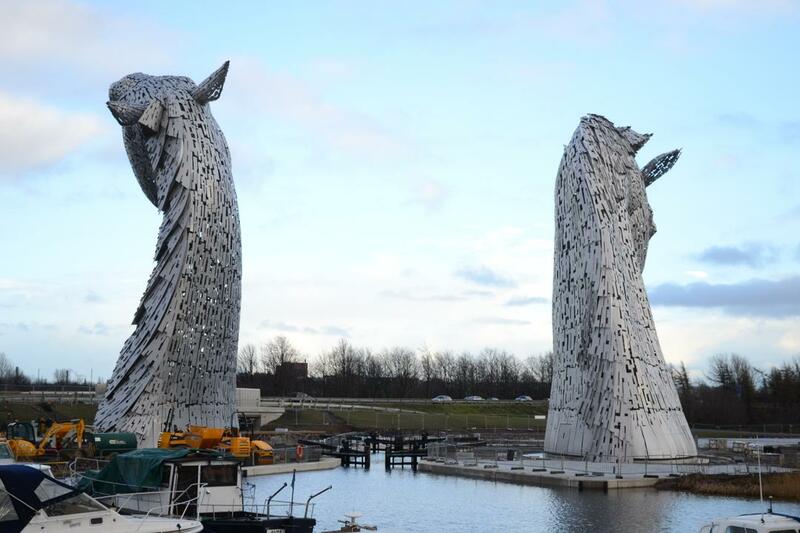 A new lock lowers it slightly to a round basin, flanked by enormous 30 metre high Kelpie sculptures (like silver horse's heads), visible for miles around. 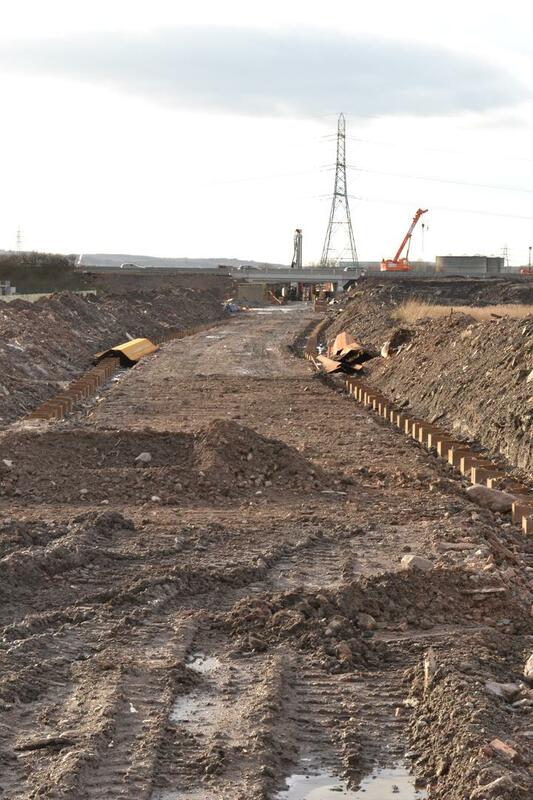 Across the basin, the new canal tunnels underneath the M9 motorway and runs parallel to the River Carron for roughly a kilometre, before joining the river at a new sealock, downstream of the problematic section of the river. 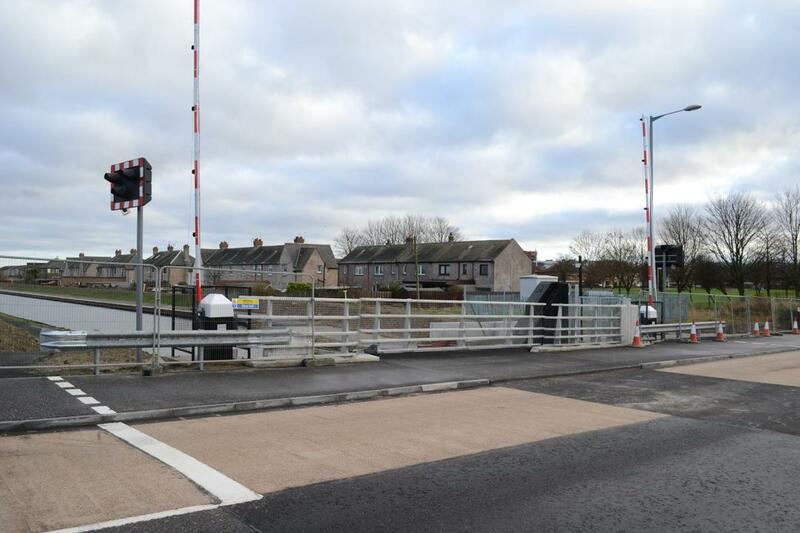 Another interesting feature on this section is a brand new single-leaf lifting bridge carrying the A905 road across the canal just south of Kerse Bridge. See below for photographs of the Helix work at various stages of its construction, which took place from 2012 until 2014. 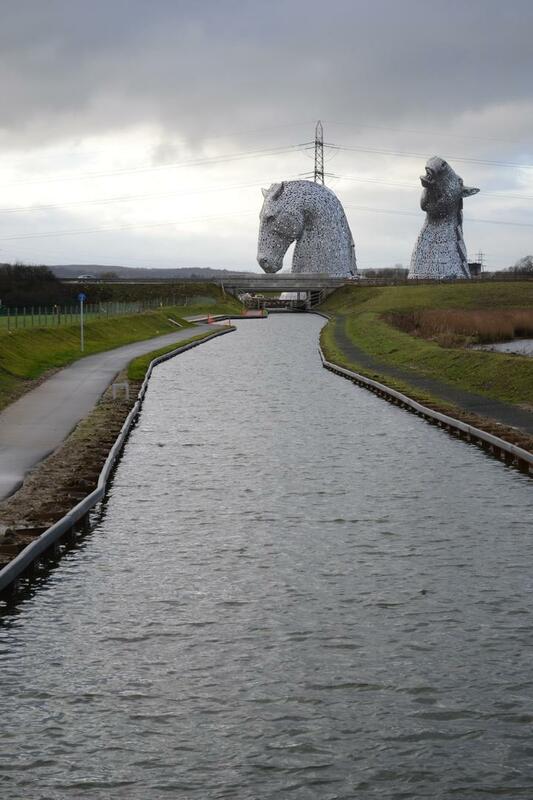 The new canal link and the Kelpies are both looking close to completion! 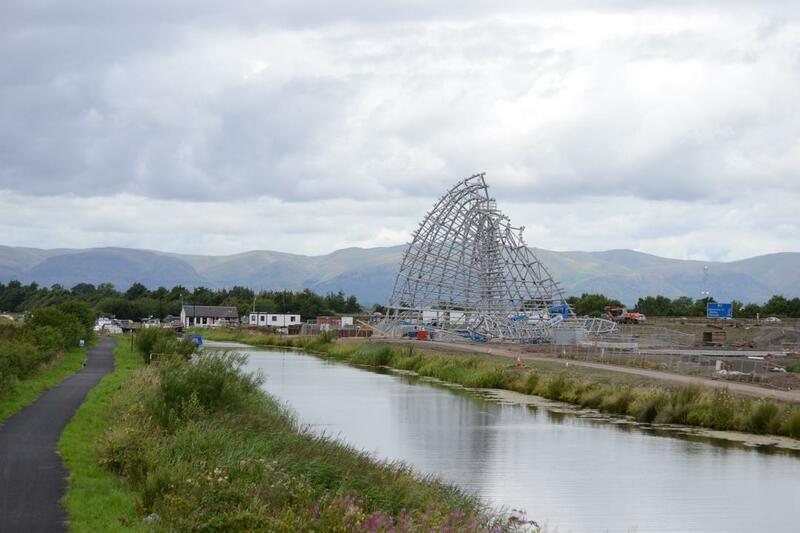 The canal channel is now in water, and the Kelpies tower impressively high above the new M9 bridge. 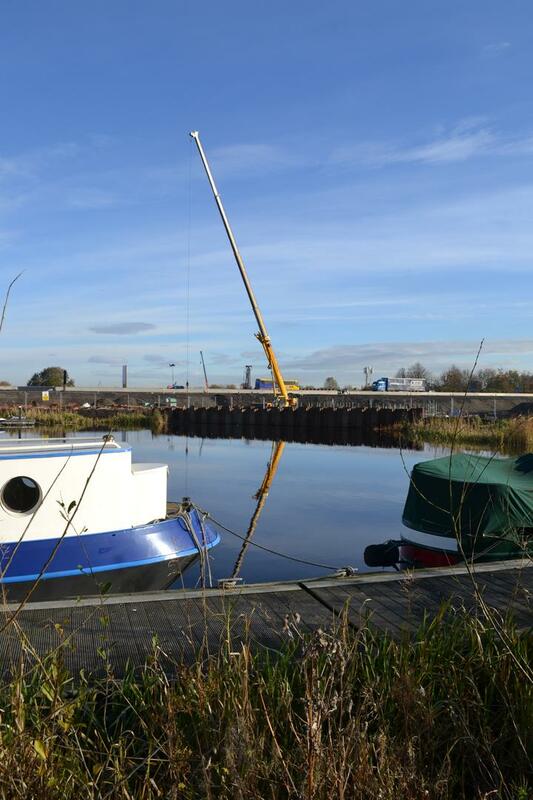 A new single leaf lifting bridge now carries the A905 road across the new section of canal. To the east, the new channel heads down the bank of the River Carron to the new sealock. 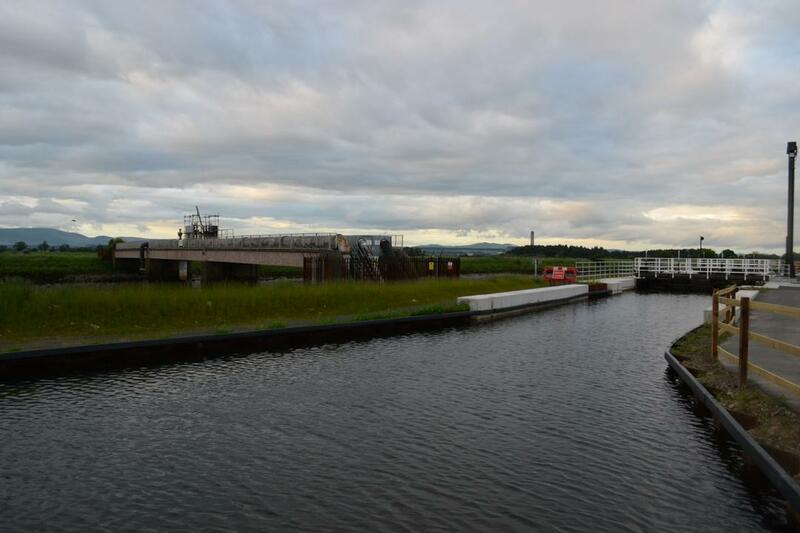 Next to the current terminal basin, the new canal has been connected to the existing basin by way of a new lock right in between the massive Kelpies. Large sections of the area are still fenced off for construction work, but it appears to be mainly just landscaping that's still to be done now. 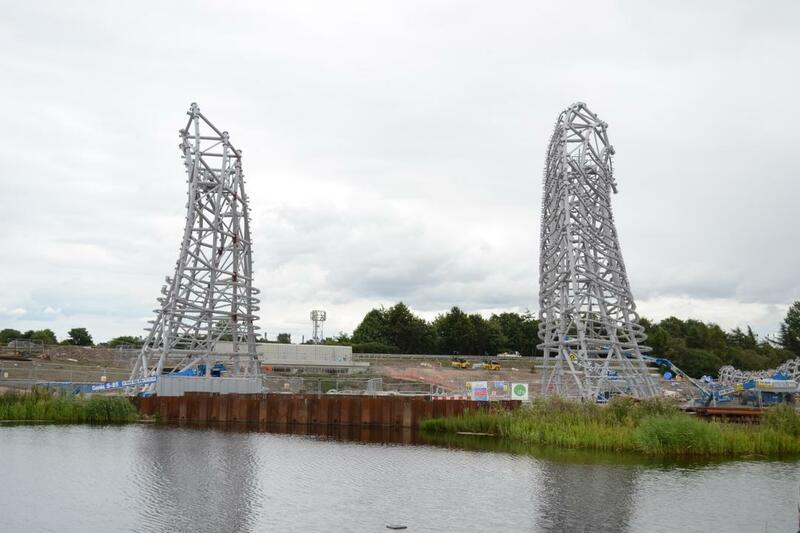 The Kelpies are now under construction! They aren't identifiably horse-shaped yet, but they're already impressively huge, dwarfing the buildings around the canal basin. The rest of the site looked much as it did in April, but no doubt progress is being made. In front of the now-completed M9 bridge, another bridge is under construction, presumably for a path or an access road. 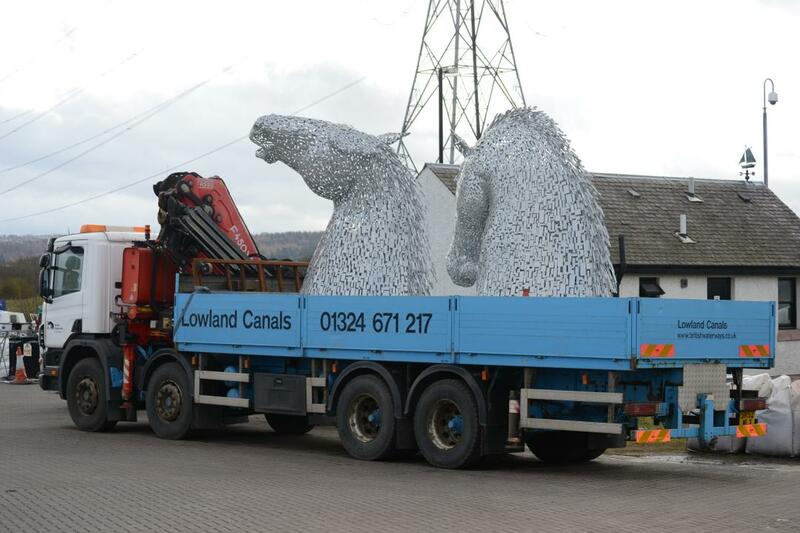 Small versions of the Kelpies on the back of a lorry at the basin. The final ones will be ten or fifteen times bigger! 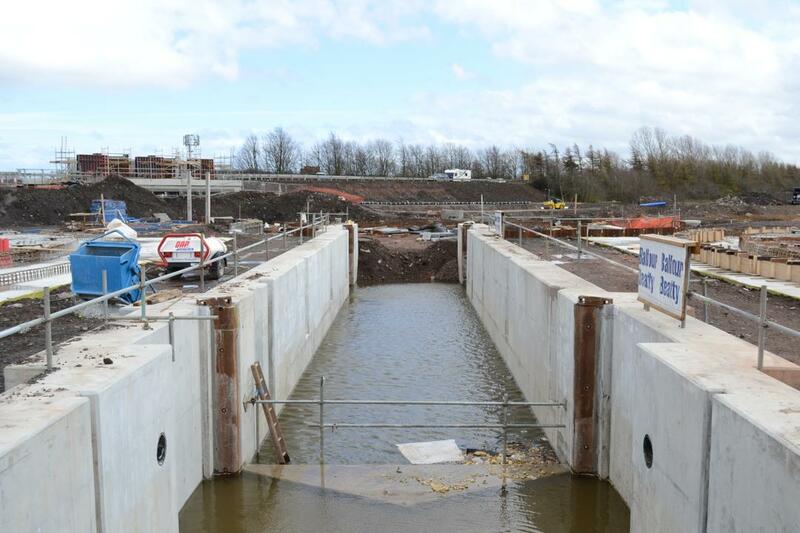 The new lock on the east side of the basin is taking shape nicely. 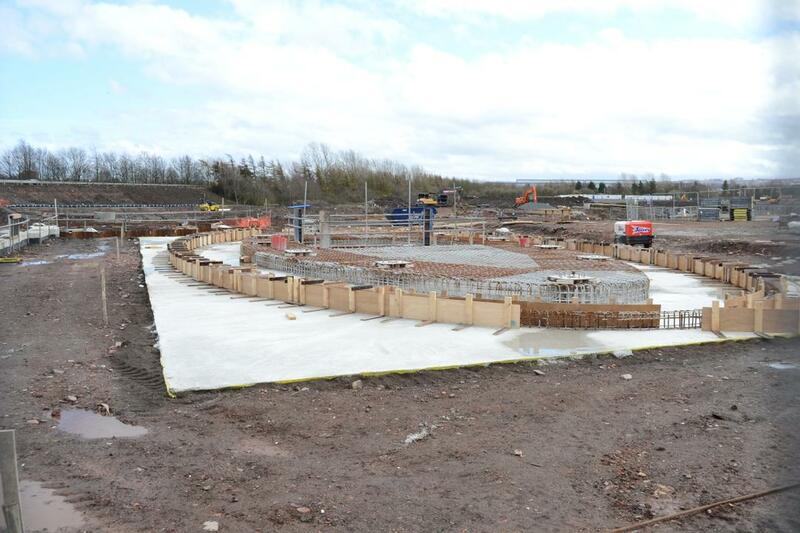 These oval shaped constructions either side of the new lock will form the bases for the huge Kelpie sculptures. Looking from the A905 to the new M9 bridge. The bridge structure is now complete and traffic restrictions have been lifted. 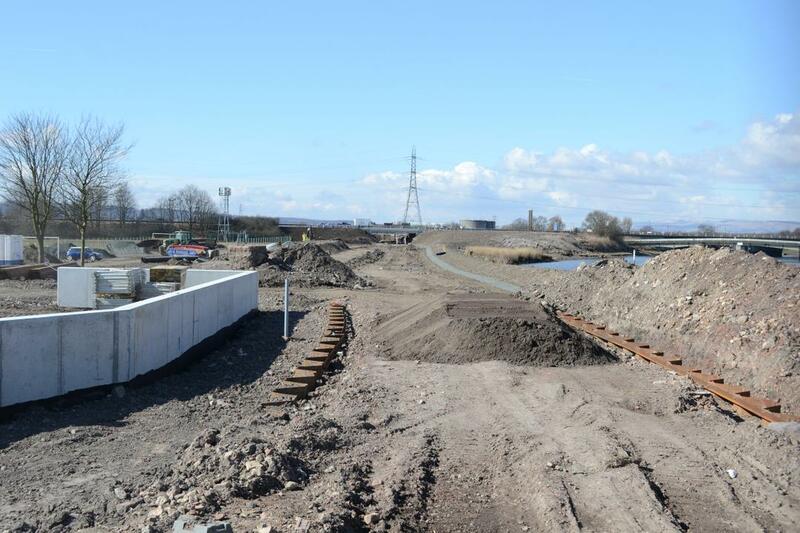 The concrete on the left may become part of the A905 lifting bridge. Looking downstream from the same spot. 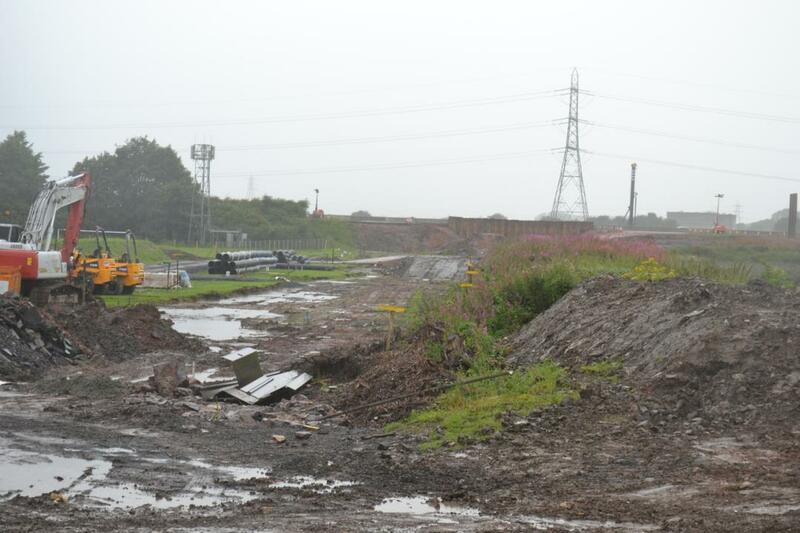 The shape of the new canal channel can now be made out. Looking down the line of the new canal from A905. The ground has been cleared and levelled. Looking from A905 towards the motorway. 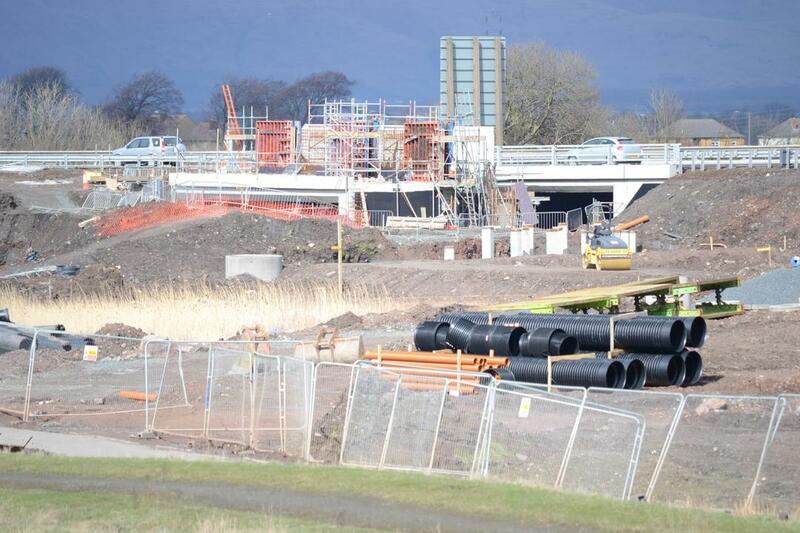 The channel is taking shape and the concrete deck of the M9 bridge can be seen. Looking down the canal to the current terminus. 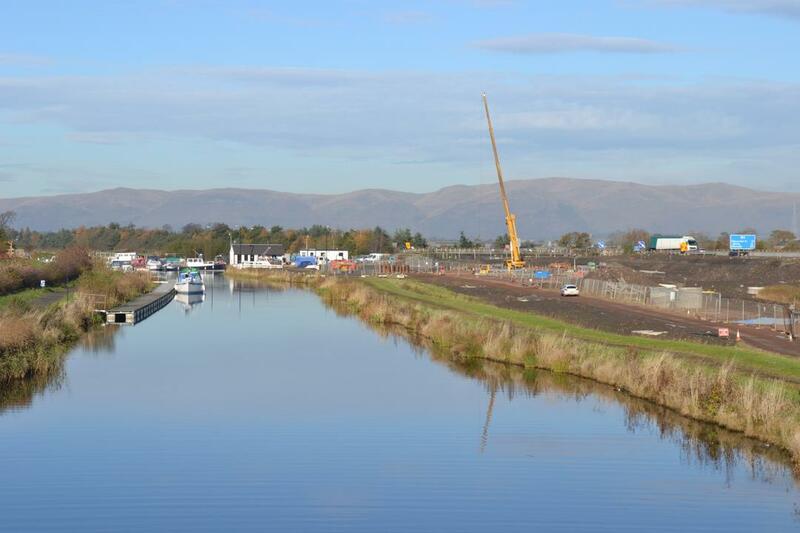 On the right is where the new lock and the Kelpies will be built. Sheet piling separates the canal basin from the construction site. 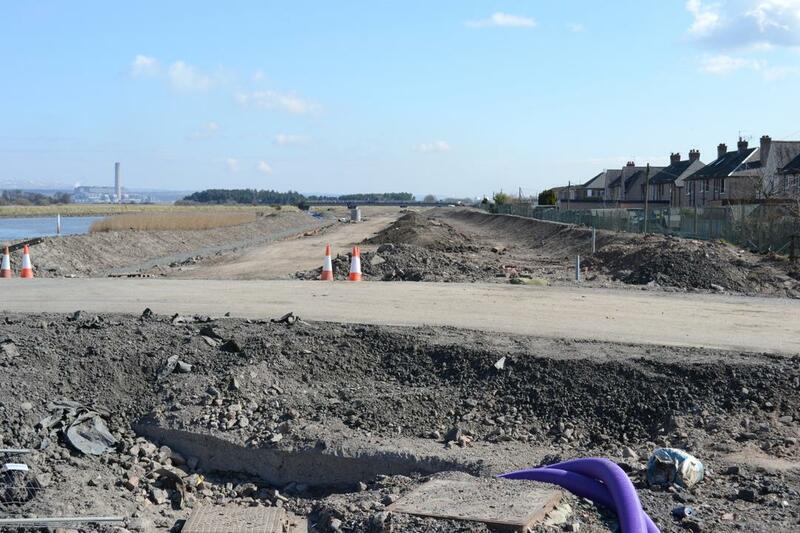 In the background is the site of the new M9 bridge. 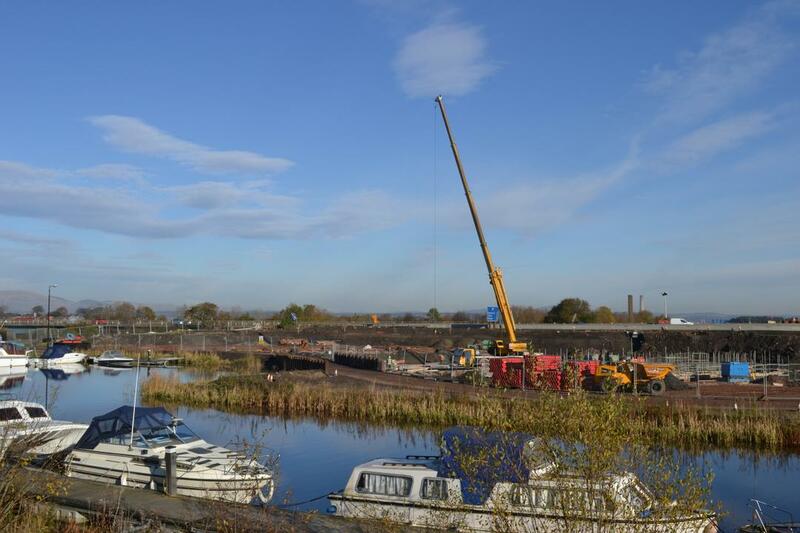 Looking across the working canal to where the new canal will branch off. The motorway bridge work is between the bus and the lorry. 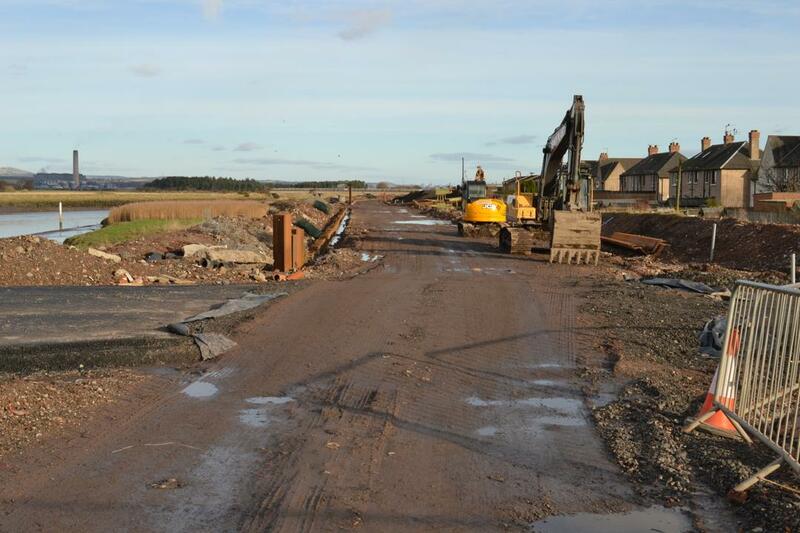 Looking down the Carron from the A905, towards the site of the new sealock. Looking the other way, towards the M9. Sheet piling can be seen where the new bridge is being constructed.